A lady came when I was in hospital. She came to see me and mummy and then helped us get a new home. I met my Cradle to Kinder worker at Monash Medical centre the day before I had James, I had been put into hospital with high blood pressure and had a caesarean section, James was six weeks early. I got to know my Cradle to Kinder worker as she visited and spent time with us and helped us organise transitional housing before James came home. We don't always see eye to eye and it can be hard to hear that I need to make changes in some areas of my parenting. After our time together I do think about our conversations and the changes I can make to be a good mum, I'm doing the best I can. The best part of the Cradle to Kinder program is having personalised support, socialisation through groups and being involved in the QEC 5 day program which my worker organised for me. James is doing well, and my long term goal with the program is to help me build more of a relationship with James. 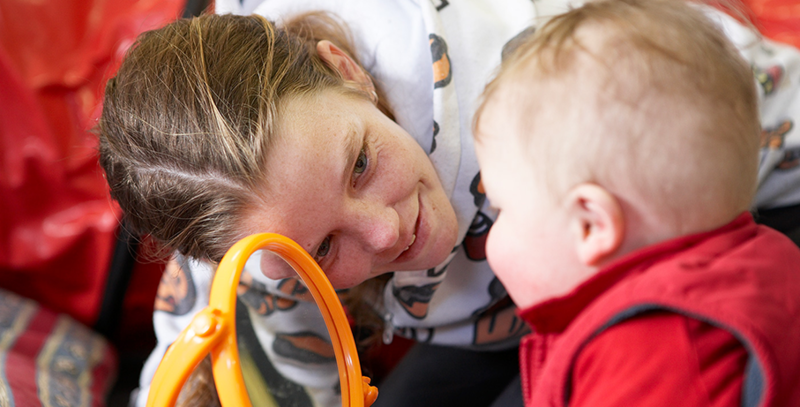 We aim to provide a child focused, strength based approach to supporting young vulnerable families. The intention is to promote the health and development of both the mother and the child, assist families to make positive changes and increase their confidence and build self sufficiency. Over the course of the program we witness many ups and downs and different challenges faced by families with young children, however it can be very rewarding, especially when you see how families can grow and develop. This is an antenatal and postnatal case management and support service that provides intensive family and early parenting support to vulnerable young mothers and their children. Support for a young woman commences during pregnancy and continues until the child is 4 years old. The program focuses on building the capacity of parents to support and promote their child’s health, safety and development. It will also build the parent’s own self-reliance through access to education, vocational training and employment. Furthermore, it aims to increase the family’s connections within their local community. The target group for Cradle to Kinder is women under the age of 25 years when a report to child protection has been received, and where there has been significant concerns for the well being or welfare of the unborn child, or when there are a number of vulnerabilities that indicate concern for the well being of the child when it is born, and the young woman is not yet involved in the child protection system. Priority of access to the program will be given to women who are, or have been, in out-of-home care. The same priority is also given to Aboriginal women and women with a learning difficulty. This program runs over a 4 year period. Staff provide case management, they are available to their clients throughout the week. Staff Home visit regularly and all clients are invited to group on a fortnightly basis where parenting education is provided, community resourses discussed and clients have the opprtunity to socialise. The C2K team team is a multidisciplinary team providing a VACCA support worker, Maternal and Child Health, early childhood development, social work, a youth worker. Each client will have contact with all workers during group and they are also available to offer further support during home visits. Referral to appropriate community services ensures that over the 4 years that clients are involved with C2K they will be supported by their community, have choices and support in their care for their child and themselves.